Watch collectors with numerous timepieces in their collection would agree that safekeeping their prized possessions is an important factor to take into consideration when their assortment reaches a certain level. While many high-end wristwatches come in plush boxes with luxurious packaging from their respective watchmakers, many of these boxes are exceptionally bulky and take-up a considerable amount of space. Taking this into account, a collector’s watch box is one thing to consider for keeping your timepieces neatly organized in one compact and convenient place. TheWatchery.com is pleased to announce the arrival of WOLF Watch Boxes and Watch Winders. This premium crafted collection offers well-appointed storage and organization for your favorite timepieces, as well as necessary winding capabilities for one to eight automatic watches. There’s also jewelry storage cabinets, compact travel cases and tabletop valets too. 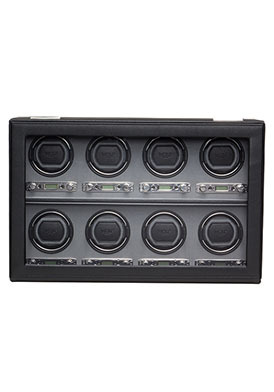 The WOLF Windsor 15-Slot Watch Box is the consummate storage case for the avid watch collector. This handsome glass topped case gives you a clear view of the numerous watches stored inside. The clipped corner styling features a supple black pebble-textured faux leather exterior with matching black stitched detail. The black faux leather lined interior is accented by contrasting silvery gray lined watch slots and matching holders. 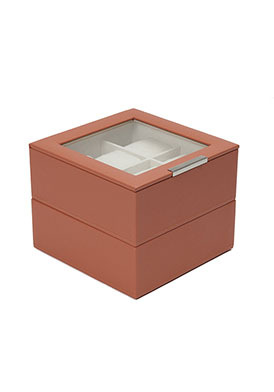 WOLF Windsor Watch Box is 13.75-inches wide, 12-inches long, 4-inches high and has a lock and key for added security. The WOLF Stackable Watch Tray Box offers sleek and stylish storage for twelve of your favorite watches. The bright coral colored faux leather exterior and cream colored ultra-suede lined interior make it an ideal choice for female watch collectors. The hinged and framed clear glass top gives you an easy glimpse of the six watches stored on top. The matching bottom tray offers easy access to six additional timepieces. WOLF Stackable Watch Box is 7.25-inches wide, 7.5-inches deep, 7.5-inches high and also comes in Orange, Cream, Navy, Brown and Black. The compact size is perfect for a dresser, dressing table or vanity table top. Let your favorite watches travel first class with the WOLF Blake Watch Roll. 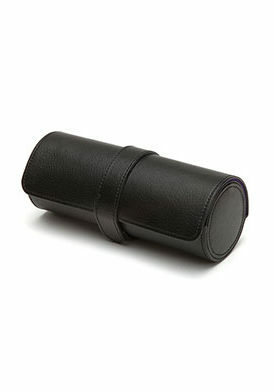 This compact and stylish cylinder case is ideal for travel with a supple black faux leather exterior and plush purple ultra-suede lined interior with ample room for three watches. The hinged top has a snap closure for added convenience. The WOLF Blake Watch Roll is 3.25-inches round and 8-inches long. Owning an automatic watch is absolutely essential for a serious watch collector and having a watch winder is equally essential and necessary to keep your automatic watch running when not in use. You’ll find a variety of WOLF Watch Winders, whether you have one or eight automatic watches in your collection. The WOLF Savoy Single Watch Wood Winder offers premium craftsmanship inside and out. This handsome cabinet is expertly crafted in burl woods with lustrous gold colored hardware and a footed base for added stability. The burl wood top and framed tempered glass front panel are hinged for easy access. The black faux leather lined interior adds distinction. Winder has clockwise, counter clockwise and bidirectional rotating functions, start options and backlit LCD display. WOLF Savoy Single Watch Wood Winder is 8-inches wide, 8-inches long, 10.25-inches high and has a built-in lock for added security. 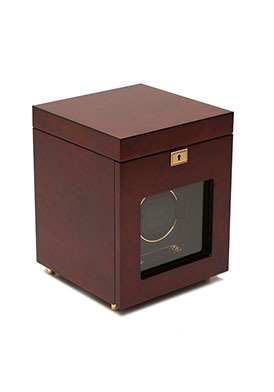 The WOLF Viceroy 8-Slot Watch Winder is the quintessential watch winder for the automatic watch collector. This expertly crafted winder keeps up to eight of your automatic watches optimally running when not in use. This rectangular shaped case has handsome black faux leather exterior with a hinged framed glass front panel and chrome colored hardware. The silvery-gray lined interior has LCD back lighting and eight individual winders. Features include individual start functions, clockwise, counter clockwise and bidirectional rotating functions. 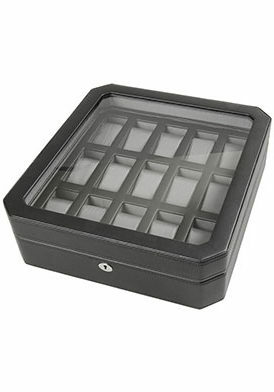 WOLF Viceroy 8-Slot Watch Winder is 20-inches wide, 6.5-inches deep and 13-inches high. 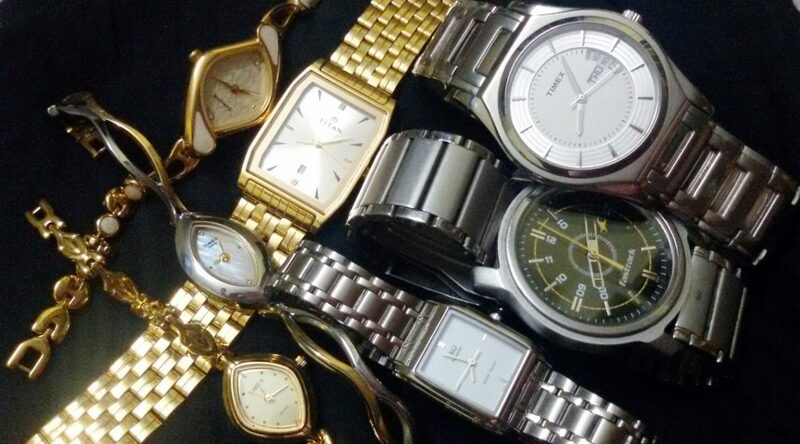 Watch collection image courtesy of Wiki Commons.